I'd be a much bigger hip hop fan if more of the genre were like Canadian rapper Wordburglar. His third album, appropriately titled 3rdburglar, recently hit retailers. It's another dose of funny, funky, fiesty, and of course, nerdy, jams. The record kicks off with "Pre-Show Routine", a self-deprecating comedy sketch that shows off the kind of humour that's in store for you. The lyrics are the most important aspect of Wordburglar's music. His themes reference sports (Brett Hull, Sidney Crosby, Brett Lawrie, Roy Halladay, Dave Winfield killing a seagull), pop culture (Sharon, Lois and Bram, Tasha Yar, Optimus Prime, Pokemon), and Canadiana (Peter Mansbridge, Firkin pubs, Alexander Keith's, and Tim Horton's). He dedicates an entire track, "Drawings With Words", to his love (and vast knowledge) of cartoons and comic books. It's all set to a wide range of hip hop beats. 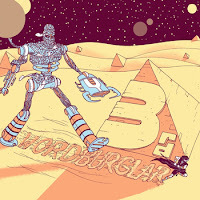 From the dark shadowy "Fred Broca" to the quirky "Sufficiently Suffonsified" to the slick groovy "Croque Monsieur", Wordburglar spans the hip hop archives for his influences. A masterful blend of themes, "Dude, Where's My AT-AT At?" combines the glory of Star Wars with the story of Dude, Where's My Car? and lays it down over some geeky gangsta rhythms. Similarly, "Your Friend's Brother" is an ode that reminisces about that guy you used to shoulder-tap. The album standout, in terms of both lyrics and arrangement, is "Rhyme O'Clock". Featuring More Or Les, the track is a never-let-up infectious jam. 3rdburglar really is what hip hop should be: fun for nerds. Best tracks: "Rhyme O'Clock", "Your Friend's Brother"
Dude, Where's My AT-AT At?